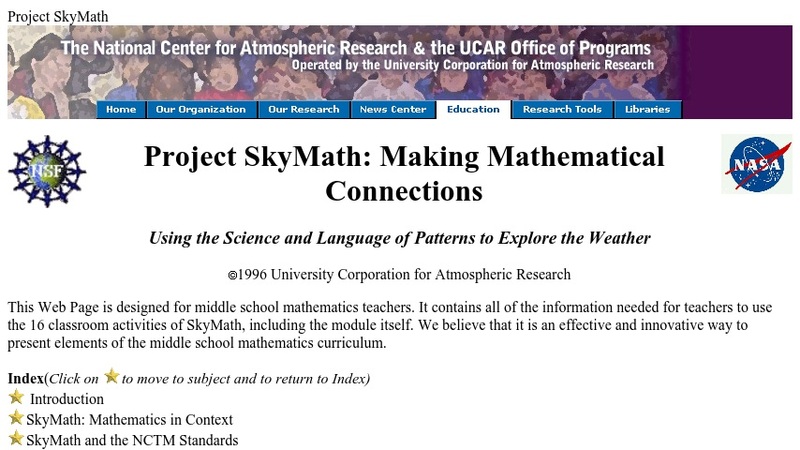 Project SkyMath is a mathematics module for middle school students, developed by the University Corporation for Atmospheric Research (UCAR). The goal of the pilot project is to demonstrate that acquiring and using current environmental and real-time weather data in middle school classrooms, in ways that embrace the dynamic and the uncertain natures of these data, will promote the teaching and learning of significant mathematics, consistent with the standards set by the National Council of Teachers of Mathematics. Areas such as data analysis, graphing, statistics and measurement are studied in the sixteen activities available. Activities include collecting temperature data, identifying various statistics of that data, and reading and interpreting temperature maps. The website includes all of the information needed for teachers to use the module as well as the module itself to be downloaded.